The Online Citizen welcomes Donaldson Tan to the editorial team! Donaldson is our new Deputy Editor. He is also the Head, TOC International. Welcome on board, Donaldson! Despite strong Christian connections, SingaNews CEO Mathew Yap appeals for netizens to judge the news portal by its content. 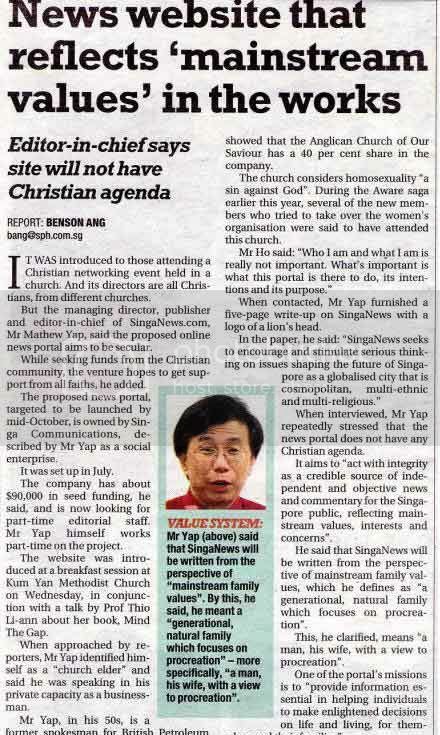 DESPITE having all $90,000 of its seed funding coming from Singaporean Christians, SingaNews CEO Mathew Yap has rubbished any notion that the online news website will serve a “Christian agenda”. Also, none of the funds have been raised from local or foreign churches or Christian organisations, he added. Without giving specific names, Mr Yap said that the contributions have all come from individuals who had given from their personal capacities. While only set to launch in mid-October, SingaNews has already drawn flak and garnered widespread attention from netizens and the mainstream media. The grouse: Speaking on the same platform as former NMP and law academic Thio Li-Ann at a Christian event held last Wednesday. Ms Thio is well-known for being outspoken about her Christian-based beliefs against homosexuality. However, she has so far denied any involvementwith the news portal. Mr Yap has also denied that Ms Thio has provided funding for the news portal. When quizzed by The Online Citizen about the decision to hold the “soft launch” at a Christian event, Mr Yap said that it was not a launch at all. Instead, it was a “market presentation to a private business networking group to introduce the idea.” He revealed that many details about SingaNews are far from finalised, such as how the news portal aims to sustain itself monetarily over the long run. Against allegations of habouring a Christian agenda, he emphasised that SingaNews is a secular organisation promoting a diversity of viewpoints. Mr Yap has also cautioned against using the “religious card” in criticising SingaNews, calling it “discriminatory and dangerous”. While some, such as prominent blogger Alex Au might construe such rhetoric as being “anti-gay”, Mr Yap argues that believing in the family as the basic unit of society is not something exclusive to Christians, but a belief held by people of all races and religions. Furthermore, he has also emphasised that the website will be open to alternative views. “Any meaningful debate must involve examining issues from different points-of-views in an intellectually honest and civil manner, without fear of labels,” he said, citing the example of the repeal 377A debate, which has driven a schism between many Singaporeans. Mr Yap has voiced no objections about putting up an article that supports a repeal of the controversial legislation. Despite the criticisms, Mr Yap seems sure that SingaNews will be able to fulfill its stated mission. Portraying an air of confidence about the professionalism and neutrality of his news staff, he dismissed the idea that SingaNews would succumb to bias in its news reporting and commentary. Despite the Christian background of many of the editors, Mr Yap reiterated his staff’s commitment to “fair, accurate and objective” reporting. Other than having some non-Christians on the editorial team, he further revealed that Singanews will be approaching several Muslim candidates for the Malay section.